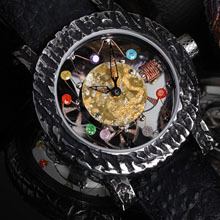 The wonderful world of unique timepieces in the "Luxury Watchmaking" sector commands insanely unaffordable prices in the real world. Such watches remain the privilege of the exceptional few, not to mention the exceptionally wealthy few. But it took the imagination of Yvan Arpa and his team, or rather teams, to rise successfully to the challenge of creating "unique pieces" at mass-production prices. The idea was to bring together the finest, supremely qualified master watchmakers, accustomed to working independently, with meticulous attention to detail and an eye to tradition, namely "Team 1". While "Team 2", however, was carefully hand-picked from among those Artists drawn by Conceptual Art, fired by an all-consuming passion for combining the often somewhat contradictory, if not mutually exclusive, Art and Technology. The result of this collision of ideas was a resounding success: without suffering loss of quality, or comprising the product's luxury appeal, the price squeeze immediately led to the birth of a legendary object. After an interval of reflection/implementation and the creation of a master team, its craftsmen all pulling together to give form to the craziest of ideas, the dream became a reality, blurring the limits between the possible and the impossible, the one sometimes overlapping the other, much to the surprise of even the creators themselves. The following details will give collectors and watch passionates alike a clearer insight of the techniques involved and of the Art incorporated therein! 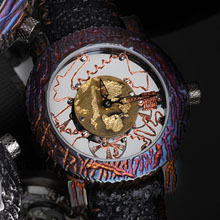 But what truly stretches the boundaries of the imagination, what is more incredible still in this collection of unique one-off ArtyA pieces, their case having been literally struck by lightning, is that the Quadri-rotor squelettes have all been hand-crafted in their entirety. 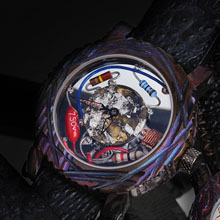 We are in the presence of a genuine work of collective inspiration, in which conceptual Art (the lightning used to shape the case, the skeleton-work and hand-crafted dials) and the work of the fine watchmaker (rotor, hands, movements) come together to create an exclusive, one-of-a-kind objet d'art at a very affordable price. c) minutely decorated the movement 2671 in accordance with fine watchmaking codes (circular graining and Côtes de Genève). iii) the Quadri rotor bijoux, in which precious or semi-precious stones, seemingly suspended, appear to float amid the skeleton-work like a constellation in the heavens, thus harnessing the full power of light to which they are subjected. Come and pay us a visit, we're very proud of all our "secrets"
Bracelet : “Alzavel waterproof” treated leather and hand-sewn high-tech rubber, or “crazy frog” tanned cane toad. Buckle Treated steel pin buckle. *Depending on the mood of the moment, the cases in the lightning-struck “Coup de foudre” collection undergo thermal combustion, modelling, engraving and other operations performed by hand in the Artya ateliers.